There is no doubt that in churches all across America, we’re experiencing divisions that break along generational lines. Here’s the most obvious example: For several decades now—certainly, since the 1980s—we’ve seen “worship wars” and other vocal, emotional disagreements regarding what motions and music we should share when gathered as the body of Christ. I wish I had easy answers. First of all, Christ’s kingdom would grow. Second, I could write one of those best-selling “How to Do Church” books and use the proceeds to take care of the financial needs of a local church or two. I don’t find satisfying the current approaches many churches are using. In some cases, they establish two cultures under one roof, leading to competition for prime worship times and resources. Other churches cater to a particular generation, and often look quite successful doing so. But what do you do when you age out of a “young” church? How does a church clinging to the “old” ways ultimately survive? I do think I’ve glimpsed the beginning of an answer. It has taken shape in my mind as I’ve spent this week studying the Book of Ruth, an Old Testament text taking us back to the early days of the Israelites, a time when the people were ruled by God-inspired judges rather than kings. The story is primarily about a Jewish widow, Naomi, and her non-Jewish daughter-in-law, Ruth. Ruth and another non-Jewish daughter-in-law, Orpah, are widowed when Naomi’s sons die. Naomi had moved with her husband to Moab during a famine, but once all the men in her family are gone, she decides it is best to return home to Bethlehem. She tells her widowed daughters-in-law to go back to their Moabite families and find new husbands. It is good advice; Naomi has nothing to offer the young women, and all three are in danger of dying in poverty or even by violence without male protectors. Orpah takes Naomi’s advice and departs. Ruth loves Naomi dearly, however, and cannot leave her. Modern-day mother-in-law jokes clearly would have eluded the young woman. “Where you go, I will go; where you lodge I will lodge; your people shall be my people, and your God my God,” Ruth says. She even makes a poignant promise to die where Naomi dies, a statement rooted in the poor odds they face together. A sad, bitter Naomi accepts Ruth’s company from then on. The story ends like a fairy tale; all involved find their happiness restored. 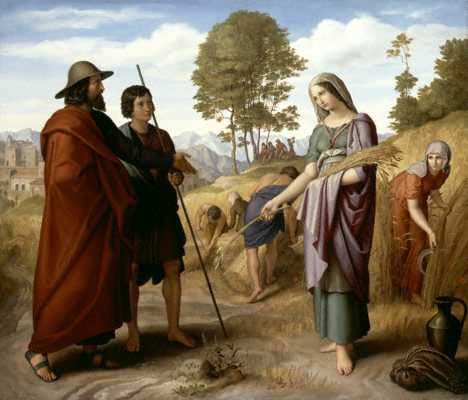 Generations later, this non-Jewish woman who faithfully followed her mother-in-law despite their desperate circumstances is remembered by the Jews as the great-grandmother of King David. And according to Matthew 1, she also is in the lineage of Jesus Christ, making her a symbol of how God has used broken circumstances to redeem the world. It all worked because two women from two generations loved each other desperately, to the point that each was willing to sacrifice for the good of the other. Ruth gave up all she had known to follow Naomi, with little hope in sight. Naomi risked being rejected by the people in her home village, her last safe retreat, when she brought home a Moabite woman. Sacrificial, intergenerational love is the beginning of how we strengthen our churches, I think. When we as Christians are concerned for our own wants, our own desires, we are being ruthless. When we are Ruth-like, and Naomi-like, each generation looks to the other’s interests, clinging to each other, refusing to depart each other, going so far as to say I will die where you die before I will allow us to be separated. Who wins? In the Book of Ruth, everyone does, even as they fall over themselves to take care of one another. This story of intergenerational sacrifice is the loving crucible in which Jesus Christ ultimately was formed. In our churches, similar sacrifice could spark a resurgence in the Holy Spirit’s willingness to work among us.